How Does Snoring Mouthpiece Works? A Snoring Mouthpiece supports the jaw in a forward position to help maintain an open upper airway. 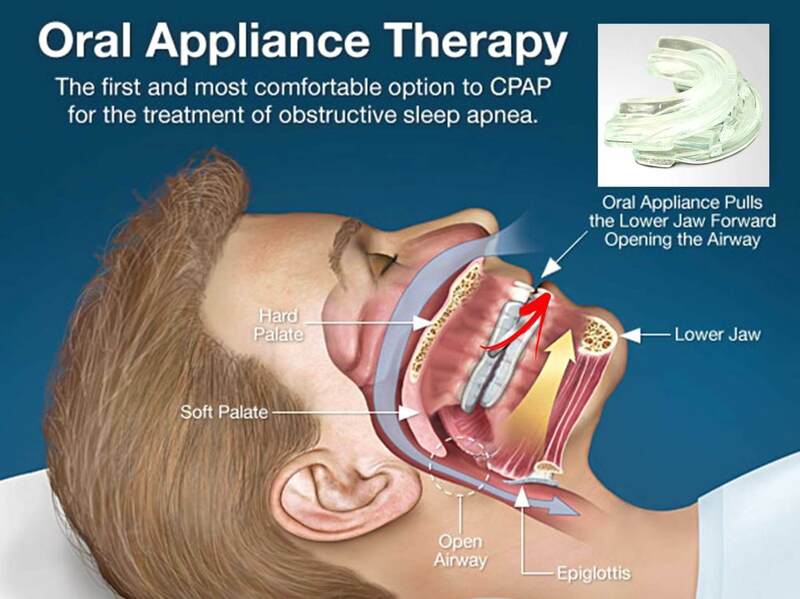 Research shows that oral appliance therapy is an effective treatment option for snoring and obstructive sleep apnea. Snoring is usually caused by a partial blockage of the upper airway behind the tongue. When we’re awake, our breathing is unobstructed as our body consciously keeps our upper airway open. But when we’re asleep, the muscles around our airway relax, and the airway often becomes narrower. For most people who snore, air rushing through the narrowed opening causes the soft tissue in this part of the upper airway to vibrate, making the sound of what we call ‘snoring’. How Does Snoring Mouthpiece Opens The Airway? View this diagram (bottom), it explains in detail how the mouthpiece works. You can see how the airway is blocked by the soft tissue, but as soon as the anti-snore mouthpiece is in position it holds the soft pallet and tongue forward and naturally opens the airway. ► Move your lower jaw forward, try and snore! ► Now you can see for yourself that if your lower jaw is held forward, this automatically opens the airway and prevents you from snoring. What Is Snore Eliminator Anti-Snoring Mouthpiece And How Does It Help? Mandibular devices have been bringing relief to snorers and their long-suffering partners for over a decade. They work on a very simple principle - It works by gently moving your lower jaw slightly forward, opening your throat and keeping the airway unobstructed, making it almost impossible to snore. The Snore Eliminator Anti-Snoring Mouthpiece was developed and designed by Dr. William Vachon, who has been an Oral Surgeon for 15-years in Myrtle Beach, SC. The Snore Eliminator is an over-the-counter mandibular anti-snoring device that works effectively with 85% of snorers (according to studies conducted in the USA). Recommended by both doctors and dentists, it is made from hypo-allergenic thermoplastic that is easily molded to the shape of the snorer’s mouth. By preventing snoring, these anti-snoring aids allow oxygen to flow properly through the body so that the snorer (and snorer’s bed companion), wake up refreshed in the morning! This results in increased energy levels during the day (no more tiredness at work or nodding off in front of the TV at night); an improved attitude; reduction in headaches (if those headaches were caused by sleeplessness, lack of oxygen or grinding of teeth); and less risk of high blood pressure, heart disease or stroke. The Snore Eliminator comes in two versions: Standard and Pro Edition. The PRO Edition Adjustable Mandibular Advancement Device can move the lower jaw forward as desired or incrementally as needed. In the Pro version, the clear measurement reading to easily calibrate the mouthpiece to your desired level, generally speaking the more forward the lower jaw then the more you open up your soft pallet airway to prevent snoring. Mandibular Advancement Device, which studies show can be more effective than surgery for normalizing sleep and eliminating snoring, which works by bringing your lower jaw forward or by lifting your soft palate or both. The Snore Eliminator™ Mouthpiece is actually a mandibular advancement splint, which prevent the soft throat tissues from collapsing and obstructing the airway when you sleep. Requiring no surgery, you can place it in your mouth yourself when you go to sleep and remove it in the morning when you wake up. The Snore Eliminator™ Mouthpiece is easily custom molded to your bite, by you at home, to be a personalized stop snoring mouthpiece for your exact Dental and Oral alignment, which patented self molding custom snoring mouth guard is second to none. With this self molding custom snoring mouth guard, it will suits and fits your mouth, which provides an effective solution for your snoring problem. It can be remolded until you stop snoring completely. Some people may complain that the anti-snoring mouthpiece is hard to get used to, but since it is soft (not hard plastic like some other products), you’ll have no problem using it every night.